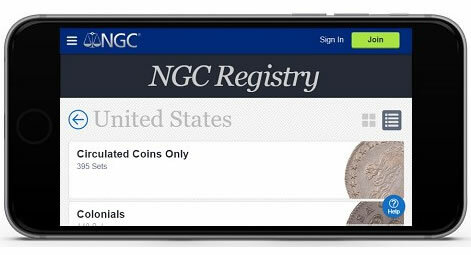 Numismatic Guaranty Corporation® (NGC) is proud to announce that an upgraded NGC Registry is now available at NGCcoin.com/Registry. 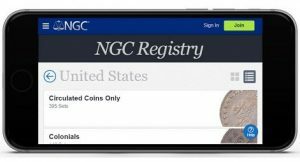 The NGC Registry is an online platform where collectors can register and display their NGC-certified coins and compete against other collectors for the best sets. A free NGC membership is all it takes to participate. Established in 2001, the NGC Registry now boasts more than 1 million coins registered in more than 110,000 sets by more than 12,000 members. The new NGC Registry is built like an elegant photo album to showcase coins and collections from around the world. To help users display their coins, the new NGC Registry has made images of more than 15 million NGC-certified coins available for free to NGC Registry participants. In addition, the new NGC Registry uses the latest technologies to seamlessly resize for smartphones, tablets and desktops. It has also dramatically simplified the process to add coins and create new sets. "The NGC Registry is one of the most exciting reasons to be a coin collector," says Mark Salzberg, NGC Chairman and Grading Finalizer. "The recent upgrades make the NGC Registry easier and more fun, and we look forward to making additional improvements in the future." As NGC works to add more functionality to the new NGC Registry, the old version will remain fully functional at its familiar location on Collectors-Society.com. For example, Custom Sets are not yet built in the new NGC Registry and will continue to be on Collectors-Society.com until this work is completed. NGC welcomes questions or suggestions for the new NGC Registry. Any feedback can be sent to newregistry@NGCcoin.com.